Brasília-based photographer Gustavo Gomes’s girlfriend Priscila went into labor and about twenty hours later, he became a father. He documented the entire process of their home birth, the messy and unedited grace of it all, until he set his camera down to catch his daughter, whom he named Violeta, as she exited the womb. 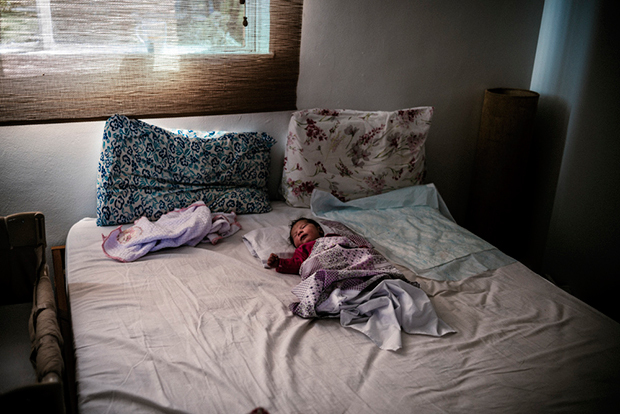 Gomes has been documenting Priscila and their home life for a long time, so it was natural to the both of them that he would photograph the pregnancy and birth of Violeta. He captured the mundane alongside the monumental, and while he sometimes tried to direct his girlfriend, the photographer found that planned images usually wound up seeming canned and sentimental, while the candid shots recorded more of what made the experience so special. The day of the birth, reports the Gomes, was “intense.” When Priscila’s contractions arrived, she was in terrible pain and unable to sleep; the photographer caught fleeting moments of rest as she paced across the living room. In the morning, he drove her to the doctor, and it was confirmed that she was dilated, at which point the couple made a mad dash home through the city’s congested streets. Gomes put his ailing girlfriend in the shower, beneath a stream of warm water, until their doula arrived to give massages and direct the mother-to-be through various exercises. Eventually, an obstetrician and a pediatrician came to help deliver the child. When Violeta was born, Gomes cried, set the camera aside, and said hello to his daughter. The labor was taxing for Priscila, but she survived and the screaming subsided with the birth. Violeta is now two months old and growing quickly. The family of three is content and happy. Gomes will continue to photograph his daughter as long as she permits it. 0 responses to "Photographer captures girlfriend's pregnancy and home birth in beautiful and gritty images"